The world’s oceans affect human health in many ways: they provide food and water to human populations; they are a point of exposure to pollutants, toxins, and diseases; and they provide pharmaceuticals and animals used in biomedical research. This course explores the interactions between oceans and human health. You will learn more about both human health issues and marine science, by studying the ways in which they intersect. You will gain an understanding of the major risks and benefits of our interactions with the ocean and will be introduced to technologies used to assess risk and to realize potential benefits. 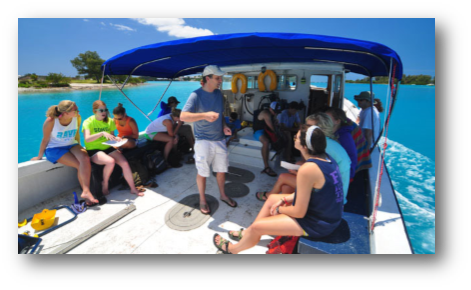 The course is based at the Bermuda Institute of Ocean Sciences, and you will have the opportunity to explore the beautiful beaches and fascinating history of the isolated island nation of Bermuda. Course description: Study of ocean processes affecting human health and the contribution of marine organisms to medicine and research. Lectures, labs and fieldwork emphasize risks and benefits of our interactions with the ocean, and related research technologies.